While at the Miami Boat Show, I took the opportunity to shoot a few abstract pieces based around the always startling and unusual Miami architecture. I could do this for days and never get tired. Unfortunately, I only had part of one! Love these, I would never have thought to do abstract of buildings I don’t think. Each one has a personality. 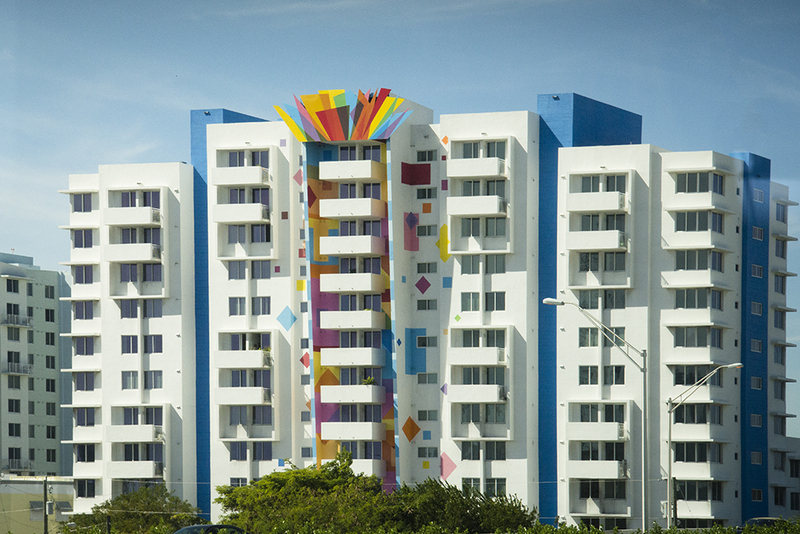 Now that is a building that can really be called fun and colorful. You inspire me, Sherry. Great shots. Your abstract images are always the best, and so fascinating! Love them all Sherry, and happy you and Bob enjoyed the boat show. No better place than Miami. Very modern architecture and that first photo with the astonishing colours sprouting out of the top of the middle part of the building are quite surprising! It makes it look like a child-like size model and the children have been having fun colouring papers and decorating! I like the reflected image with the palm tree in your slide show! Well seen! Well done, Sherry! I can just imagine how much fun you and Bob had at the boat show.